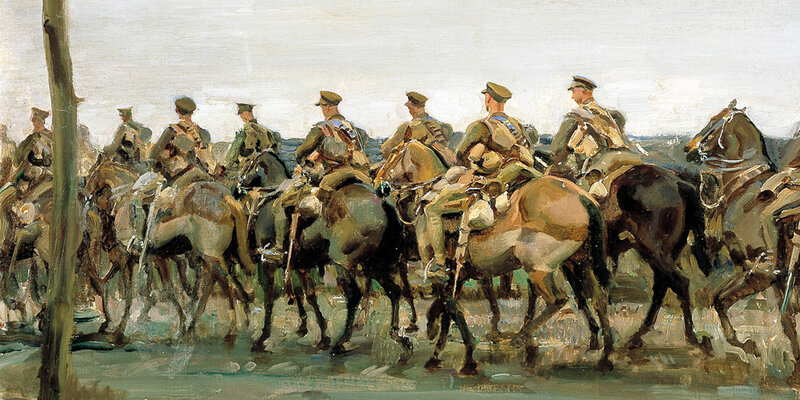 In my ignorance, I had never realised that Alfred Munnings was a war artist. Has he featured in any of the war painting exhibitions I’ve seen over the years? If so, I don’t remember. 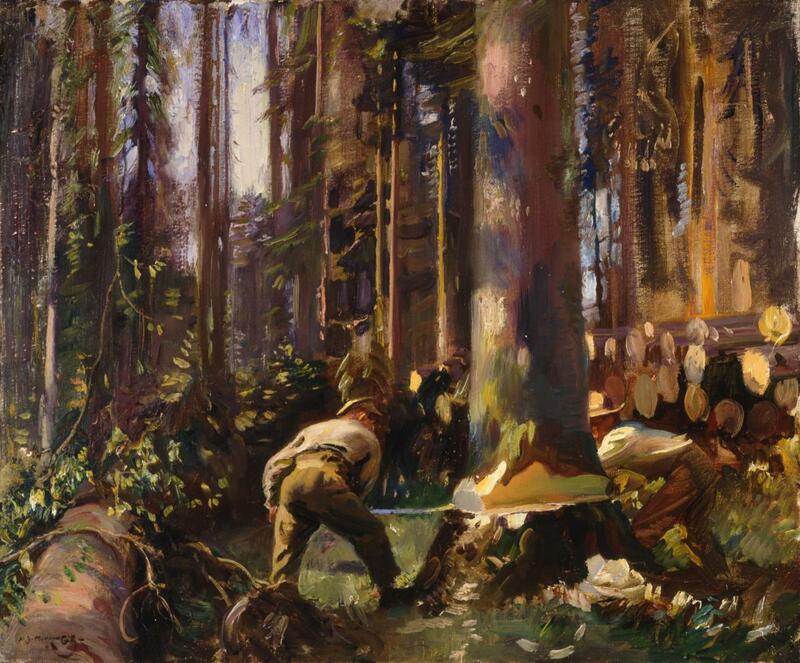 But a war artist he was, in 1918, embedded within the Canadian cavalry, and later with the Canadian Forestry Corps. Usually these paintings are kept in Canada, but at the moment there is rather a splendid exhibition of them at the National Army Museum in Chelsea. Munnings had tried to enlist in 1914, but was turned down because he only had the use of one eye (The Army was very choosy in 1914, but became less so later). In 1918 Beaverbrook recruited him to go to France as an artist with Canadian troops. He later said that it was his time with the Canadian cavalry that made his reputation as a painter of horses, and so determined the path his future artistic career would take. There are many paintings of men and horses working together, of horses on the march and horses being watered. There is only one battle picture, and that is drawn from imagination, not from life. 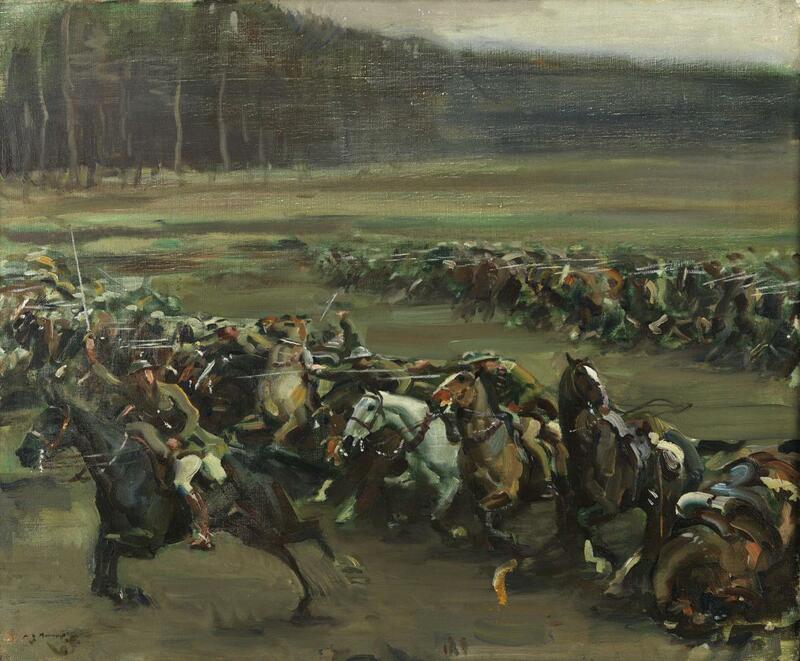 It shows the charge of Lord Strathcona’s Horse at Moreil Wood, led by Lieutenant Gordon Flowerdew, on 30 March 1918, when the Germans were threatening Amiens. The cavalry charged into machine gun fire, and Flowerdew died of his wounds the next day, but the Germans were routed from the wood, which contributed to the failure of their March offensive. Munnings followed the usual war artist convention of not showing dead bodies of men or horses. Some of his paintings are of ruined buildings, which (as often in war writing too) can be taken as a metonym for destroyed men. The style of the paintings is impressionistic.Many of the scenes are complex, integrating men and horses in a scene of work. These are paintings recording scenes rather than commenting on them. They are rather good, I think. Years later, the name of Munnings became mud among the aesthetic classes. At a Royal Academy dinner, more thansomewhat inebriated, he had made a memorable speech (broadcast live to the nation on the Home Service) attacking modernism and expressing a wish to kick Picasso up the backside. Anyone with pretensions to advanced sensibility scorned him (though his paintings of horses continued to sell very well to people who liked that sort of thing). In these #MeToo days, Picasso’s reputation is now not quite what it was (Personally, I don’t mind his sexism as much as I loathe his kowtowing to Stalin). Whereas Munnings is now rather triumphantly on display at the National Army Museum. This entry was written by George Simmers and posted on December 6, 2018 at 6:46 pm and filed under novels with tags Canadians, cavalry, forestry, horses, National Army Museum, Sir Alfred Munnings, War Artists. Bookmark the permalink. Follow any comments here with the RSS feed for this post. Post a comment or leave a trackback: Trackback URL. I love Munnings’ equestrian monument to Edward Horner in the church at Mells.